There’s something I really love about plain stockinette socks. They call to me above any other projects I’m working on. I could have a deadline to knit something by and if I have plain stockinette socks on the needles, they will win out, no matter what. (Okay, that may not be 100% true, but it’s not often I’m on any kind of knitting deadline!) It’s no surprise that these socks took me hardly any time to knit. I liked knitting them, they called to me to knit them, and as luck would have it, I was on a deadline to get them done in time for Grace’s birthday! Grace loved them and they FIT! I was excited because I wasn’t sure of her foot measurements, but I knew that her foot was probably about as wide as mine and that she wears a size smaller then me, so I knit the socks as if they were for me except making them about a half inch shorter. She loved them! I was worried she might not like them or they might not fit, so it was a relief that they fit and she thought they were great. The day I gave them to her, I was wearing my Sweet Water socks and Matt got a picture of our feet together. I’ll have to get it from him and share it with you all! I have some sad news. Juno Regina is no more. Okay, I’m not that sad over it! I was really bored with knitting it and I don’t think that having regular Addi’s (instead of the Addi Lace needles) helped at all. I just didn’t want to do it anymore. 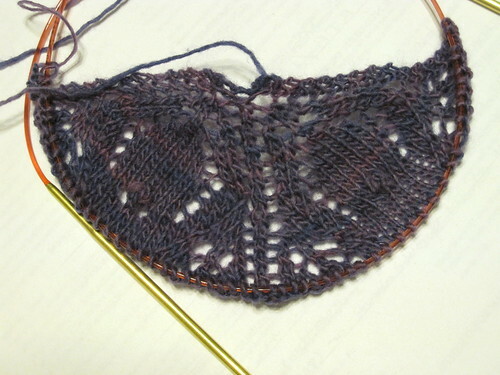 So I frogged it and cast on for the Fountain Pen Shawl from the Spring 2009 Interweave Knits. I had to get a pair of the Lace Addi’s because I simply couldn’t do the nupps with regular Addi’s. Okay, that’s a bit of a lie. I did manage to do them, but it was the biggest headache and when I finally got the first one done, I didn’t even want to THINK about doing the second one. One pair of Lace Addi’s later and I’m through the first chart and part way through the second chart. 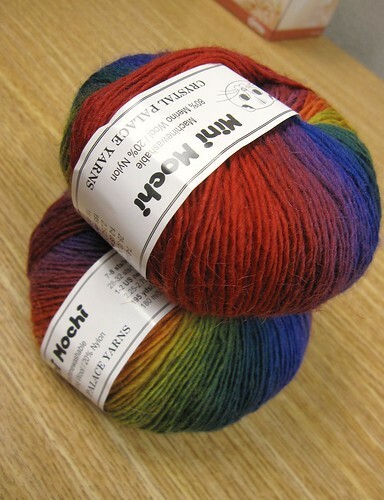 I think this will keep my interest enough that I won’t get bored and want to quit knitting it like I did with Juno Regina. The yarn is Malabrgio Lace and it’s very nice to work with, so that’s a bonus! I’ve been working on Decimal off and on. At one point, I was a few rows from what I thought was being done with the sleeve, when I took a closer look at it. It didn’t seem right, so I re-read the pattern for what felt like the millionth time and realized I didn’t follow it correctly. I had only knit ONE row between the decrease rows instead of 7 (or 5 for the last few). Needless to say, I had a lot to rip out. I was NOT happy at all. I was so upset I didn’t even want to see it for a long, long time, but I decided it would get me nowhere to stick it in the UFO pile, so I ripped it out, picked up the stitches and started knitting the pattern the correct way. I’ve got 3 more decrease rows to do, then however many rows until it’s the right length and done. I’m over half way done, so I don’t think it will take that much longer. 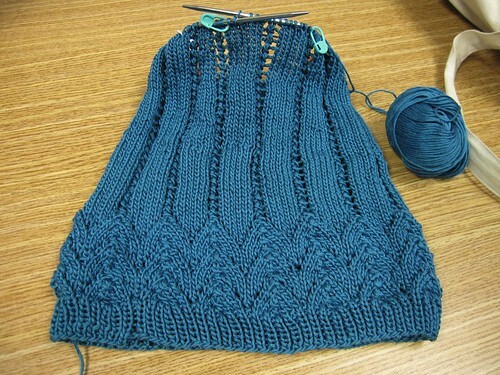 I’d like to have this sweater done before it’s too hot to even consider wearing it! Last week I stopped at Yarns & Fabrications to get the Lace Addi’s and I saw that they had Mini Mochi! I knew it was coming soon, but wasn’t sure when, so it was a nice surprise to find they’d got it in already. Of course this meant that I had to take some home with me! Very pretty yarn and quite soft. 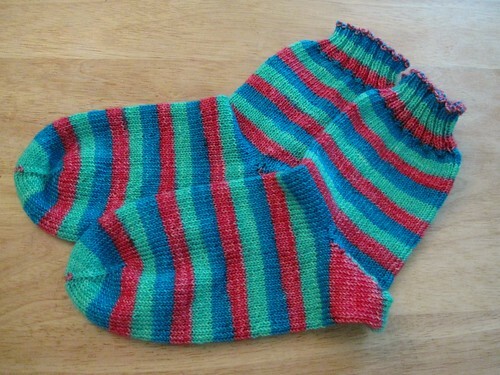 I think the resulting socks will be warm and perfect for the cold months. I have a few other things I want to show you, but I’ll save it for next time. This post is already long enough! Happy crafting! Ahh… I do the same thing. Frog it if you’re done with it!! Can’t have a project laying around if you know you’ll never complete it. I know some people can’t seem to frog even if they know it will stay that way for eternity. Me – nope – I want my yarn back!!! I do love the Mini Mochi – Gorgeous.